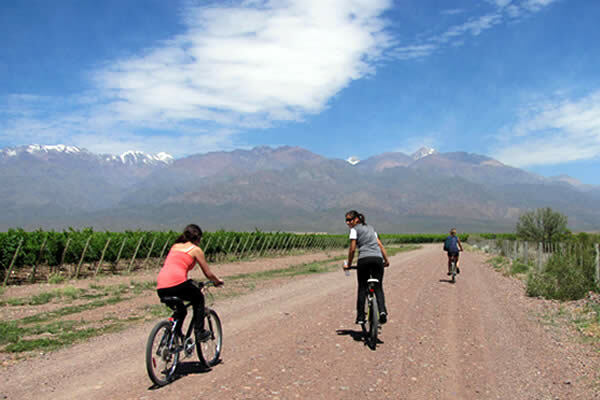 On this tour we will explore Mendoza’s Wine Road by bicycle, visiting some of the most important wineries in the area. Accompanied by expert guides we learn about the production facilities, the different styles of wine-making, the gastronomy and we will enjoy a great wine tasting session. Chacras de Coria: is part of Lujan de Cuyo, only 15 minutes from the city centre, it is known for its country houses, tree-lined streets, fine restaurants and world renowned bodegas. This quaint, picturesque town is the perfect place to enjoy a captivating wine experience. We start our tour in the morning, accompanied by your tour guide we will leave the city behind and head south towards the region known as the Cradle of Malbec. Set amongst the gentle hills and over-looked by the high mountain range of Chacras de Coria - Lujan de Cuyo is one of Mendoza’s main attractions. The area provides luxury accommodation with Lodges and hotels set amongst vineyards, fine Restaurants, Spa & Relaxation facilities and internationally renowned wineries. Shortly after leaving the city, we join Chacras’s winding road, following the famous curves until we arrive at the main square. Here we prepare for our day of wine biking. After a safety briefing, we begin our journey cycling along the Wine Road which will lead us to some of Argentina’s most prestigious wineries. In these wineries we will have guided tours and wine tastings. We will enjoy a BBQ lunch with wine by a renowned chef who has developed the best gourmet dishes to accompany the various varieties of wine that is produced here. After lunch, we will return to the city with a good knowledge of the world of wine, the gastronomy and Mendoza’s beautiful landscape. End of tour, return to Mendoza City. This tour includes a study of the different qualities of wine produced at each of the wineries we visit in Chacras de Coria (Lujan de Cuyo). This will provide a good experience and understanding of wine. We learn the relationship between wine, the wine regions, the wine making process, the architecture and design of the wineries and gastro fusion.